2022 Olympic Winter Games | 2022 Olympic Winter Games | Ecosign Mountain Resort Planners Ltd.
Ecosign Mountain Resort Planners of Whistler British Columbia, would like to congratulate the Beijing Bid Committee on successfully being awarded the honor of hosting the 2022 Olympic Winter Games. 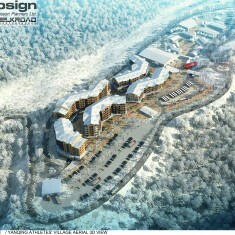 Ecosign played a key role in the preparation of the Chinese bid and won a competition over two other international firms for the right to prepare the Bid Committee’s concept plans for the snow cluster venues and two athletes’ villages.. The planning for the Beijing (Yanqing County) competition area covers competition venues for Alpine Skiing (Downhill, Super G, Super Combined, Giant Slalom and Slalom) and the Sliding Center for Bobsleigh, Luge and Skeleton. 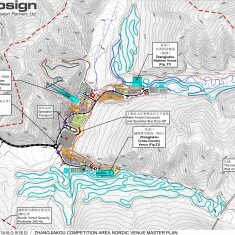 An Athletes’ Village is also proposed in the Yanqing Competition Area to accommodate 1,300 athletes and officials. The Yanqing Competition Area is approximately 16 km² in area and lies about 70 kilometers northwest of the Beijing City Center. The Zhangjiakou Competition Area covers an area of 66 km² and is situated 220 km northwest of Beijing City Center. The Zhangjiakou Competition Area includes the design of venues for Cross Country Skiing, Ski Jumping, Nordic Combined, Biathlon, Freestyle Skiing and Snowboard. 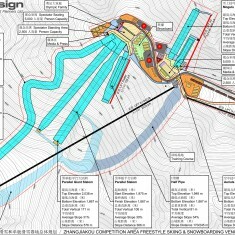 The Freestyle Skiing and Snowboard venues will be located at Genting Secret Garden. The Zhangjiakou Competition Area includes an Athletes’ Village which can accommodate in excess of 3,000 Athletes and Officials, Media Centers and other functional facilities as required. 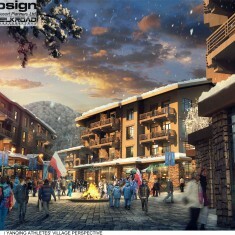 Ecosign was the lead designer and worked in conjunction with ISC IBG, who prepared the sliding center plans, Zehren and Associates Architects who prepared building facades and interior floor plans of the Athletes’ Village and BARE Advertising who assisted in the production of a promotional video of the concepts. 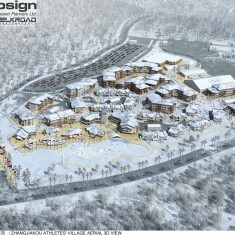 Chinese based rendering company Silk Road was hired to prepare the 3D views of the master plan. 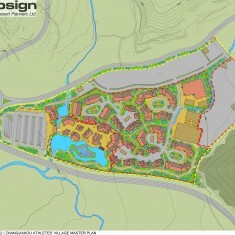 Ecosign commenced the planning work in July of 2014 and completed the plans for submission to the Bid Committee at the end of August of the same year.